This brilliant array of red and yellow flowers is a real attention-getter. Red spray roses and bright red Gerbera daisies pair with golden yellow alstroemeria and pompons. 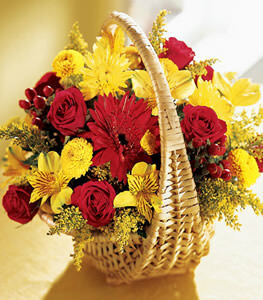 Designed in a handled basket, its great to give for any occasion.